Together with growing trade ties, incremental advances like the recent talks in New York are significant. The story of an enduring Indo-Pakistan rivalry is a familiar one, in which the neighboring states, born of a bloody partition, are trapped in an endless cycle of conflict. But this narrative perpetuates two false habits. The first is a static understanding of Indo-Pakistan relations, pessimistic in its fixation on their violent history. The second is a reductive understanding, in which the emphasis on security obscures the long and successful record of cooperation. In the context of increasingly adverse domestic political environments – with India’s jingoistic right wing and Pakistan’s irredentist military hindering the diplomatic process – there is an even greater need to re-think India- Pakistan relations. The two countries have maintained a patchy ceasefire over the de facto border in Kashmir – the “Line of Control” – since 2003. This year’s ceasefire violations began in January with the beheading of an Indian soldier, with a further 150 breaches since then, far exceeding last year’s total of 117. 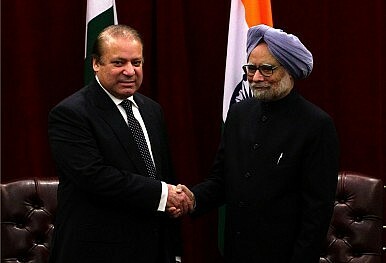 Things came to a head last month when, on the eve of high-profile talks between Nawaz Sharif and Manmohan Singh in New York, militants who had secretly crossed the Pakistani border killed eight Indian security personnel and a civilian. The attack was deliberately timed, and follows a pattern of attempts by terrorists to frustrate the bilateral peace process. These latest attacks prompted uncompromising statements by Manmohan Singh who chose his speech at the UN General Assembly to denounce Pakistan as the “epicenter of terrorism.” India’s President Pranab Mukherjee, on a foreign trip to Belgium, echoed these words, condemning Pakistan for failing to apprehend terrorists operating on its soil. These warring words were fodder to journalists keen to report on “growing tensions.” But the timing and venues are significant: international visits, far removed from governmental roundtables, are opportunities for leaders to send policy-free signals. Singh and Mukherjee’s bold declarations were aimed therefore not at their Pakistani counterparts, but were placatory statements calculated to appease increasingly hawkish elements in India’s domestic politics. Both sides face powerful obstacles to bilateral talks. In Pakistan, Nawaz Sharif must wrestle control over foreign policy from the army, the institution that toppled him in a coup in 1999, and his ability to tame militant groups, who threaten to jeopardize Pakistan’s security policy, remains in doubt. Across the border, there is a sense of stasis. Singh can do little between now and next year’s national election, when his term as prime minister will end. The ascendant BJP – India’s ultra-nationalist party – advocates a zero-tolerance approach to (alleged) Pakistan-sponsored terrorism. Though the foreign policy of Narendra Modi, the BJP’s prime ministerial candidate, remains unclear, many fear he betrayed his position after his vociferous criticism of Singh’s decision to go ahead with talks. But this preoccupation with cross-border terrorism masks a number of important facts. First, the emphasis on low intensity conflict is the result of Indo-Pakistan relations being largely peaceful. Second, attributing militant attacks to Pakistan is almost impossible. Pakistan is experiencing a “sorcerer’s apprentice problem”: having once funded and trained combatants, militant groups have turned renegade and now act according to their own interests. Third, as recent bomb blasts in Peshawar prove, of the two it is Pakistan is acutely vulnerable to sectarian, extremist and terrorist violence. Lastly, though low intensity conflict persists, figures show a consistent decline in violence between India and Pakistan since the 1990s.